The dentures may feel bulky and even loose while the muscles of your cheeks and tongue learn to keep in place. It is not unusual to experience irritation or soreness. You may find that saliva flow temporarily increases. One or more follow up appointments are generally needed after a denture is inserted. If any problems persist, particularly soreness, please call the practice. 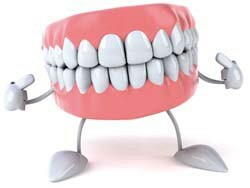 Like natural teeth, dentures must be brushed daily to remove food deposits and plaque. Brushing helps prevent dentures from becoming permanently stained and helps your mouth stay healthy. It is best to use soap or washing up liquid to clean dentures. Toothpaste can be quite abrasive. Speaking with new dentures may be difficult at first, however, with practice, you should find that you are able to speak normally in a few weeks. Even with full dentures, you still need to take good care of your mouth. Every morning, brush your gums, tongue and palate with a soft-bristled brush before you put in your dentures. With regular professional care, a positive attitude and persistence, you can become one of the millions of people who wear their dentures with a smile. Please note that if you were fitted with immediate dentures or have had a tooth added to an existing denture following an extraction, you may require a denture reline or new denture constructed once your mouth has healed. There may be further costs related to these treatments.